Credit Card Compare's 'in-house millennial' reviews new cloud-hosted digital bank – Up – and gives his thoughts on why digital banking is the future. Millennials more than any other demographic don't trust the traditional banking system and are looking for alternative options. How Up Bank is combating consumers expectation of convenience and transparency through push notifications, merchant ID identity, spending habits insights and much more. Up Bank will be bewildering for most baby boomers, puzzling for Gen Xers, and possibly a yawn for older members of Gen Y. That’s fine, because Up Bank is not for them. It’s for younger Millennials and members of Gen Z, like me. We understand it, and we need it. When they weren’t using cash, my grandparents’ generation paid with cheques and tried to keep track of their balance by doing sums on the stubs left behind. My parents scoffed at this, had their debit and credit cards manually imprinted, then swiped, then inserted, and by the time they got to waving and tapping they thought the future had arrived at last. 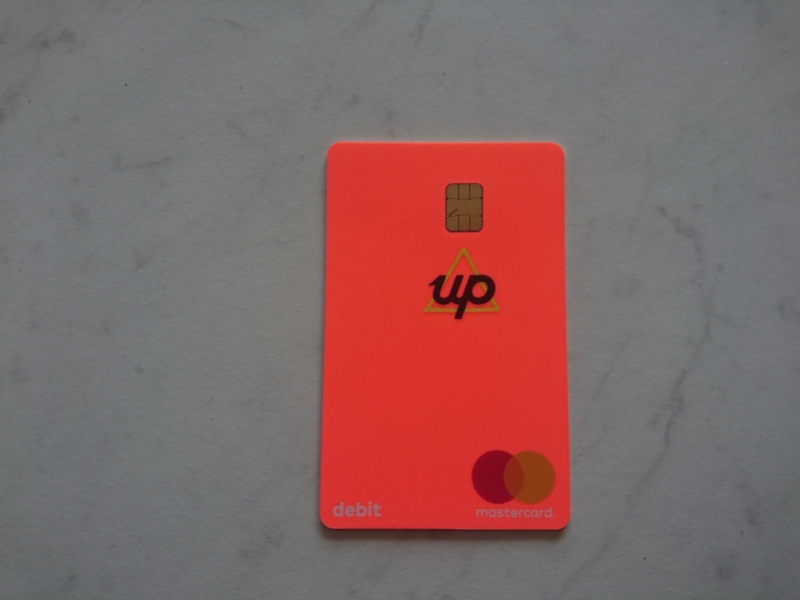 And for the rest of us, who know the future can never be pinned down, there’s Up Bank and the Up app + debit card. Right now you may be thinking “What are these credit card guys up to, reviewing a debit card?” And sure, the Up debit card isn’t going to replace my credit card any time soon. But we like to inform our audience of new and exciting things happening in the banking and finance industry, and this is certainly one of them. 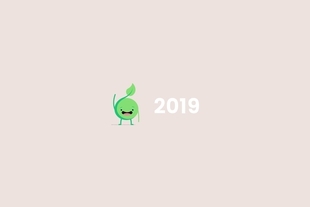 It's 2019. I'm not going to stand in line and wait for a teller, or even go hunting for a ATM. I want to control my finances exclusively online. Up Bank got a head start on their digital neo-bank competitors by partnering with Bendigo and Adelaide Bank, so they were able to launch on 9th October 2018 without having to wait for a restricted banking licence. The banking platform is hosted by Google Cloud Services and is in fact Australia’s first cloud-hosted bank. Founder Dom Pym said at the launch that Bendigo and Adelaide bank gave them “the creative licence to design Up in the most ‘non-bank’ way possible. It has meant we can offer customers a new way to manage their money ahead of everyone else”. I don’t know about you, but the revelations in the Banking Royal Commission left me with conflicted feelings about traditional banks. I also realise it is 2019, so I'm not standing in line waiting for a teller, or even an ATM. 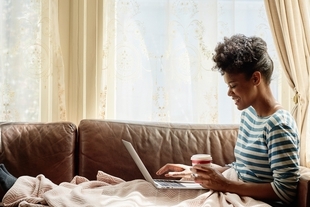 I want to control my finances exclusively online (as far as possible), just as I do with every other part of my life. So I was ready to give Up a go. Got a couple of minutes? Get the app. Get a card. There’s no waiting around with Up Bank. In less than three minutes I signed up, got the app and created my Everyday bank account after providing just my driver’s licence details. (I could have used my Medicare card number or passport instead.) Nothing else required. 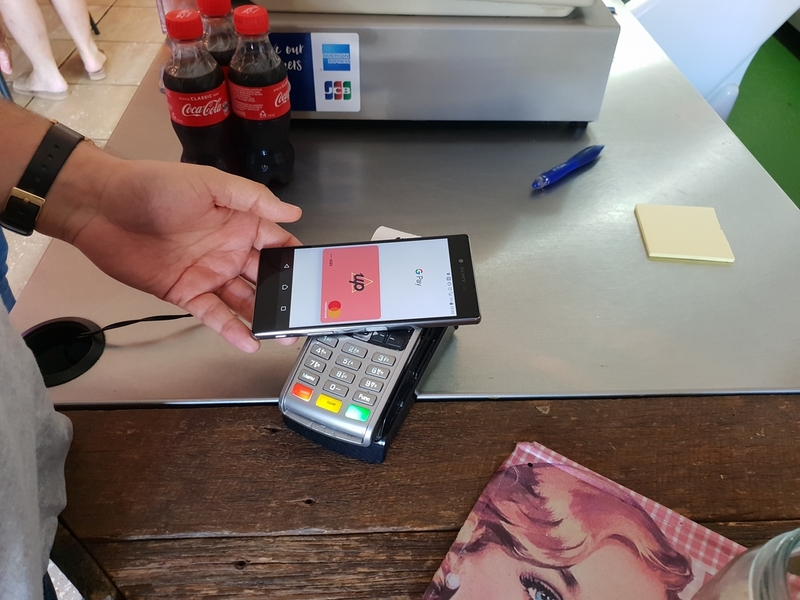 Another cool feature that saves me time is being able to pay with Google Pay via my Android phone and smartwatch. I always have my phone in-hand so it is even easier to use NFC to pay than conventional tap-and-go with a physical card. You can use Apple Pay if you have an iPhone or other Apple mobile device. 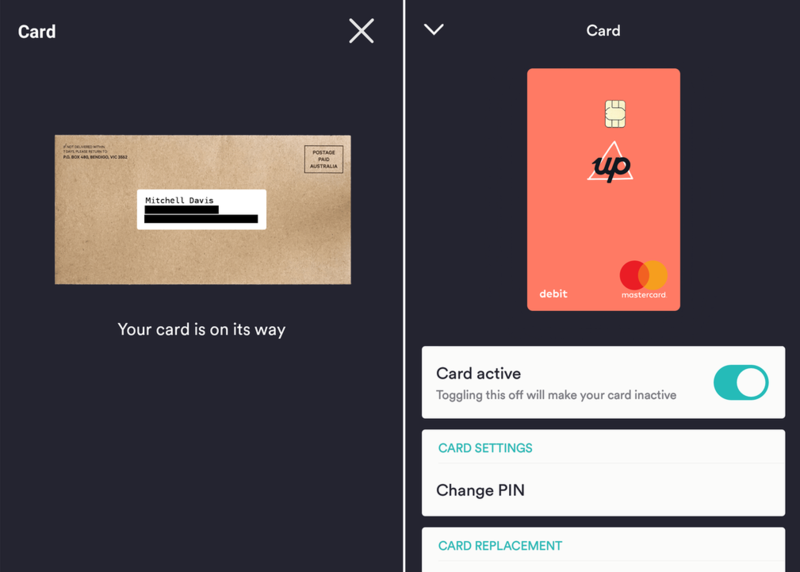 Up is also compatible with Garmin Pay and Fitbit Pay if you’re one of those weird people who like to bank and pay while they’re out exercising. 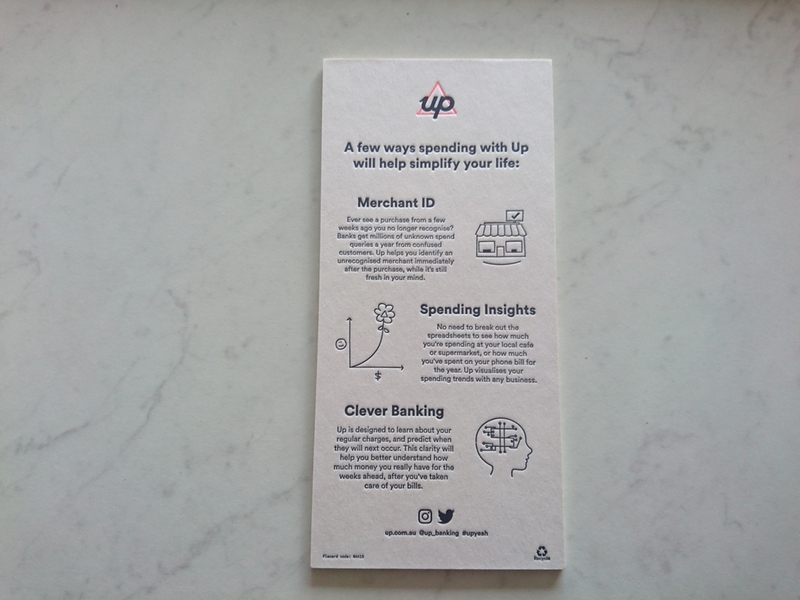 As a banking sector marketer, I absolutely LOVE Up Bank’s approach to packaging, presentation and customer service. It’s consistent from the moment you download the app until you have the card in your hand, and then use it. Up sweats all the tiny details. 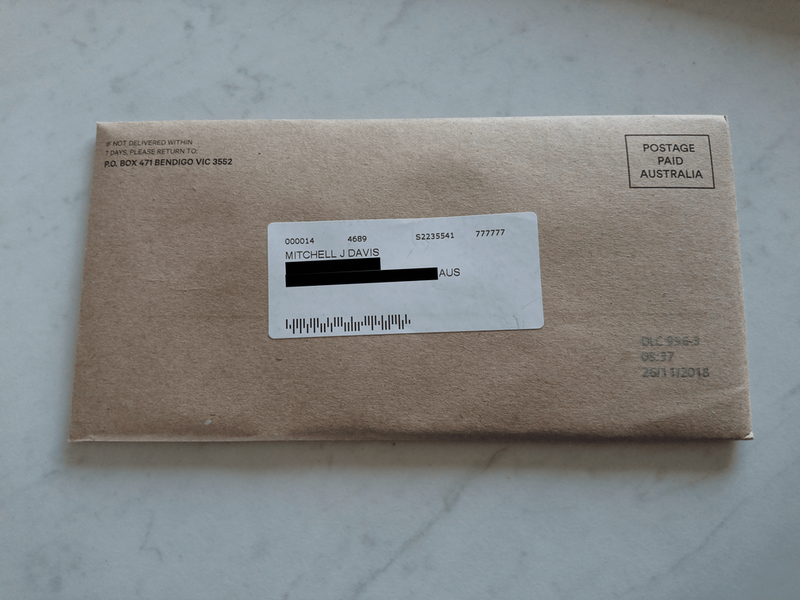 The first little feature that had me hooked was the option in the app to click through and see my card before it arrived, neatly wrapped in the envelope it was in, complete with my personal details and address on the outside. 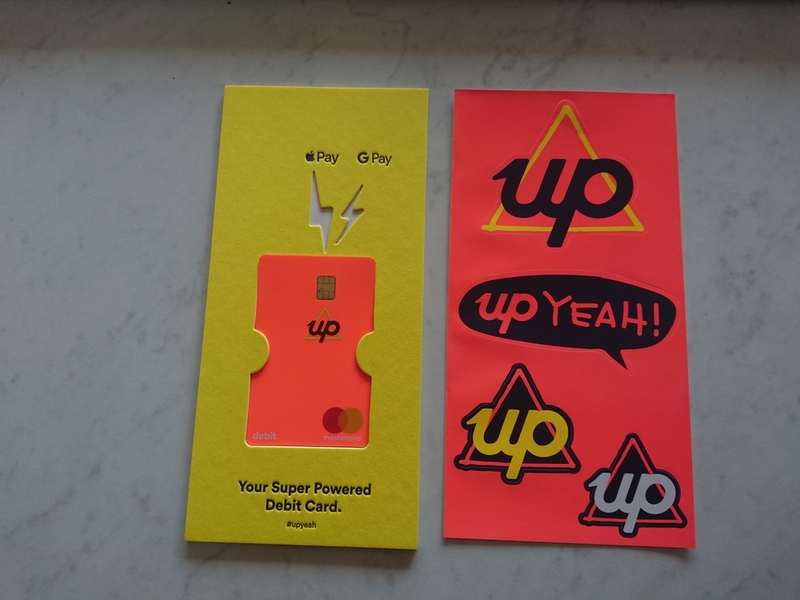 A debossed cardboard sleeve in 80s retro colours housed the card inside the envelope, with accompanying stickers emphasising the ‘up YEAH!’ message – which can’t be missed because it’s underscored by the card’s pared-back and upended (i.e. vertical, instead of the traditional horizontal) design. I have cards with a few different banks and none of them have managed to nail the App experience like Up Bank have. If there is one thing that a lot of banks just cannot seem to get right, it is creating a simple app that is easy to use while maintaining full functionality. Currently, I have cards with four different banks and none of them have managed to nail this area of their business. This isn't just me whining about my high expectations. If you have ever spoken to people about banks, or read any online forum about banks, it's a common complaint among customers. Up’s UI (User Interface) and UX (User Experience) are impressive. 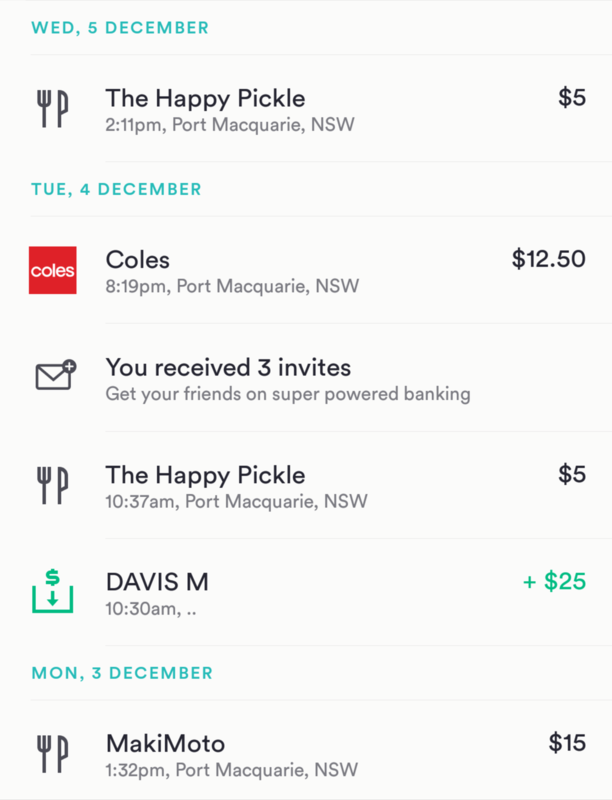 Everything is super easy to use and the platform feels like it has been created with user intent and tech as the primary consideration, and banking/debit card just being the product that happens to be hosted on this great app. You can tell that it’s a bank built by techies, not bankers. Having said that, the banking and card features are nevertheless truly awesome. There are a few debit cards, and also several credit cards, with no transaction fees levied on purchases made with merchants who use a processing centre located outside Australia. But charging a fee of between 2% and 3.5% for foreign currency conversion and/or overseas transaction processing is the norm. So it’s good to see that the Up debit card is one of the cards that don’t charge this fee. 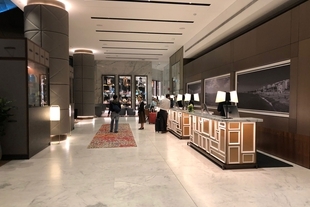 It means that when I travel overseas, or shop online at places like THE ICONIC, I won’t be slugged with an extra fee on top of the purchase price. There are no monthly fees for using the card, no transaction fees, and no Australian ATM fees if you use an ATM at a major bank. If you use an ATM overseas, you will be charged $1.50 for an enquiry, and $5 for a cash withdrawal. If you overdraw your account, you’ll pay an interest rate comparable to that charged by a ‘low interest’ credit card. You can use the app to instantly create multiple Up Saver accounts (e.g. Christmas account, Holiday account, Apartment deposit account) to earn interest on your savings, with a special temporary bonus interest rate for new customers. There’s an optional round-up feature, to transfer your spare change to savings as you spend. Call me a bit of a traditionalist if you like, but I believe you can’t be too careful where your hard-earned money is concerned. 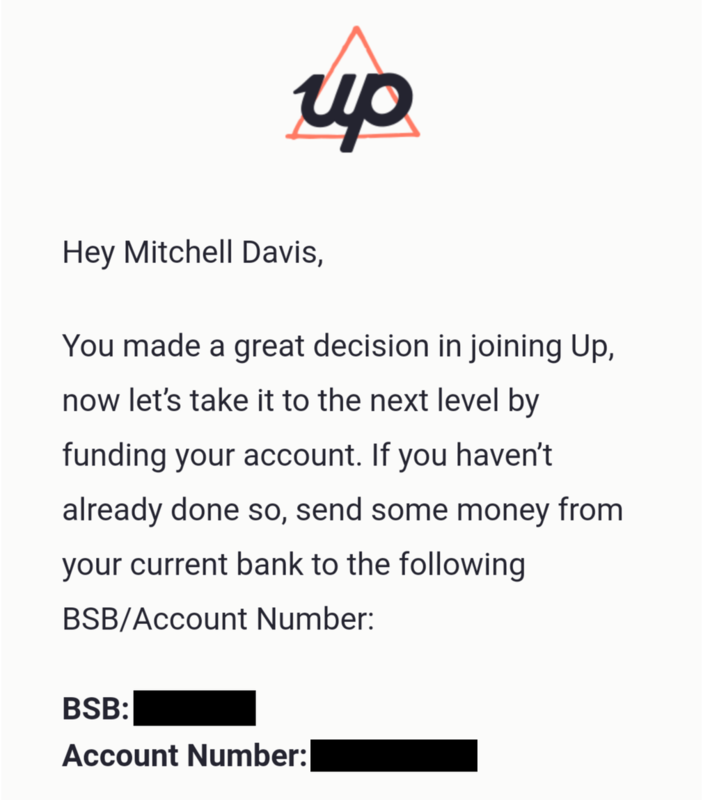 I feel secure in knowing that Up Bank is backed by the Bendigo and Adelaide Bank for banking, Mastercard for payments, and Google Cloud Platform for hosting. Up Bank may not have any credit cards yet, but I confidently predict that the day will come when digital banks are the norm, featuring in Credit Card Compare’s ‘Popular banks’ display, and making us scratch our heads trying to figure out what credit cards will be called when the only place an actual card will be found is in a museum. When I’m not putting my marketing degree into practice as Credit Card Compare’s Marketing Assistant, you’ll find me beating the boss at FIFA (sorry David) and on long romantic walks to the fridge.